SANS: Is Eco-Fashion an Oxymoron? Nowadays, calling yourself a “green” clothing line can increase brand awareness, get you new clientele, and rake in the big bucks. So why in the world is avant garde New York design house SANS fervently denying their own eco-fashion status? It would be understandable if SANS, founded by Lika Volkova and Alessandro Do Vito didn’t use eco-friendly fabrics like organic cotton, soy and wild silk, or promote home-sewing your own clothing to reduce the heinous amount of fuel that goes into the garment industry – but they do. Are they just in the mood for self-sabotage or is there a logical explanation for SANS’ startling statement? The answer lies in SMAC’s recent video profile on SANS featuring the brand’s new Home Made line of patterns. SANS co-founder Lika Volkova asserts that the simple reason that her line is not an eco-fashion company is because eco-fashion doesn’t exist. “How can fashion possibly be good for the environment?” she muses. “You produce things – you make them.” Brands that pride themselves (or even base their whole business model) on their sustainable products may not like what Lika has to say, but the logic behind her observation is difficult to dispute. All garments, with the exception of secondhand clothing, produces waste, expends energy and exploits the earth – things that can hardly be called “eco.” So it’s arguable that eco-fashion, in its most literal sense, is an oxymoron. But if SANS is not an eco-fashion brand, why are so many people in the sustainable design community giving it rave reviews? In the video, Scott Hahn, co-founder of sustainable lines Rogan and Loomstate opines “When I think about Lika’s work, I can’t imagine it being anything but green, for the lack of a better description.” So perhaps SANS’ mentality of an invisible and humble sustainability is actually the key to gaining devoted fans. Just like a true hero doesn’t call himself a hero, SANS lets its work walk the walk instead of just talking the talk. Aspiring green fashion brands, take note. So what’s next for SANS? As the video points out, the brand’s Home Made line really pushes the envelope by allowing consumers to purchase their own patterns and sew their own garments right in the comfort of their own homes. 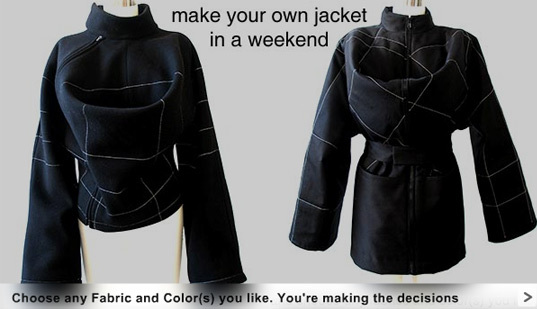 Just go to the website, download a pattern for as little as $6, pick out your own fabric (or better yet, use some you have on hand) and whip up your custom creation! While this woman is very intelligent and makes interesting points, her argument has a lot of holes in it, and in fact is a bit hypocritical and not well thought out. Well, who says that because people make it at home it will fit or be of good quality? Home sewn clothes may also not fit and be worn only once, left to rot in the back of a closet OR half finished in a 'to-do' pile instead of a warehouse. Let us not forget that sewing is a developed skill, that takes years to develop properly to ensure durability and fit. She makes it seem like anyone sitting in front of a Singer can be a tailor. Also, her methodology of production would mean that everyone would have to go and purchase sewing machines, surgers, button hole makers, and other tools and machines to make their clothes... if every household had to purchase and run these, it wouldn't be very sustainable or economical, would it? Where does the electricity come to power home sewing machines? Then everyone would have to drive to stores and tansport their fabrics to their own individual houses. That may not be very sustainable either. Logistics play a huge role in sustainability. Where does the fabric you buy "from your local store" come from? Probably from china, from fabric sales points. Why not produce it in a factory in China if that where the fabric comes from anyway? Then it at least gets produced in factories that generally currently now recycle fabric scraps. Another point is who has time to make all those clothes? Designers like this usually spend very little time in front of their sewing machines producing anything but their samples- sometimes not even that. They forget how time consuming sewing is. Mass production - or outsourcing the production of your clothes- actually lead women to have more time to do things like develop a career. I'm not devaluing sewing at home, nor am I validating mass sweat shops that take advantage of developing classes in countries with corrupt and lax labour laws- but it is something to be considered. This woman has an interesting concept- and her clothing is beautiful. It puts the VOGUE patterns of old to shame. Most major fashion labels in the 1800's to the present produce patterns to buy and sew at home. 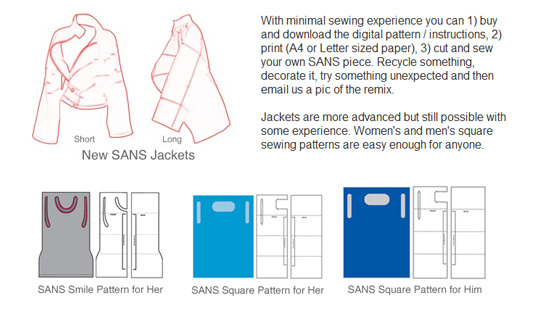 You know, the patterns that also never got purchased and sit around in the backs of fabric land or were sent to the landfill... oh now you can download them from her. We all know how sustainable computer and printer production is. E-waste isn't an issue, right? Patterns and home sewing have died off for a reason. It's not something new or radical. It's not pioneering or building a new path. SANS just does it with a neo-sustainable, ungrounded modernist attitude, that's all. I also find people who smoke (usually putting money in the pockets of huge and ethicalless corporations) a wee bit out of touch with what they preach. You know the average smoking habit takes 300 trees a year to support? Nowadays, calling yourself a "green" clothing line can increase brand awareness, get you new clientele, and rake in the big bucks. So why in the world is avant garde New York design house SANS fervently denying their own eco-fashion status? It would be understandable if SANS, founded by Lika Volkova and Alessandro Do Vito didn't use eco-friendly fabrics like organic cotton, soy and wild silk, or promote home-sewing your own clothing to reduce the heinous amount of fuel that goes into the garment industry - but they do. Are they just in the mood for self-sabotage or is there a logical explanation for SANS' startling statement?